Text editor (preferable command line). Git install instructions are available at Ojambo.com Git Source Code Management. Install Gitweb. The default folder for Gitweb Git repositories is “/var/cache/git”. 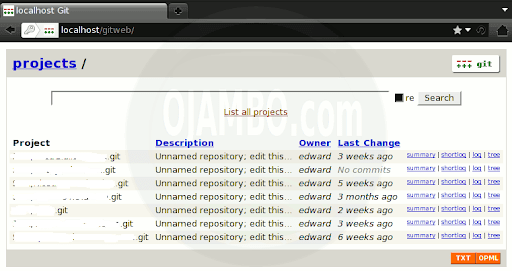 Current repositories can be moved or symlinked to the default Gitweb Git folder. 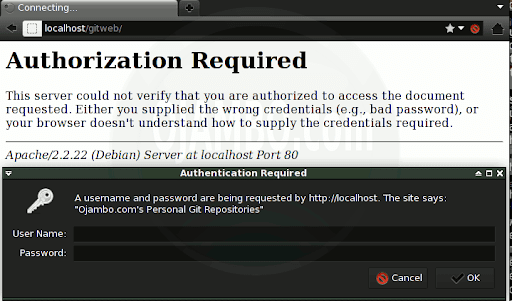 AuthName "Ojambo.com's personal Git Repositories"
For security, a password will be required for Gitweb. Apache will need to be restarted in order for the changes to propagate. More information about password protecting folders using Apache is available at Ojambo.com Apache Password Protect. Git comes with Graphic User Interfaces for browsing individual Git repositories. Gitweb allows Git repository browsing using a web browser. Gitweb must be setup manually. Gitweb allows browsing of multiple repositories. 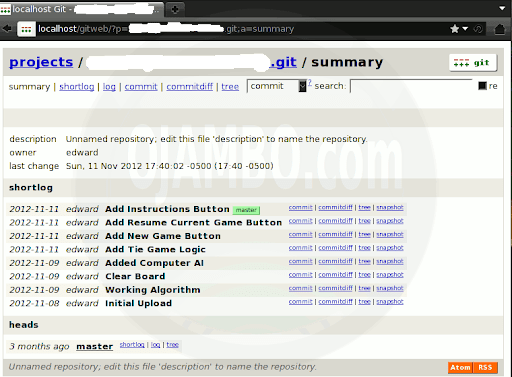 Security can be implemented for the webserver to allow only specific individuals to browse the Git repositories. Use password protection for web browsing. Link Git repositories to the default Gitweb folder. This entry was posted on Wednesday, March 20th, 2013 at 12:00 am	and is filed under Tips & Tricks. You can follow any responses to this entry through the RSS 2.0 feed. You can leave a response, or trackback from your own site.